Submit Comments to Oppose HHS Regulation! The Department of Health and Human Services has proposed a new regulation that would grant healthcare providers and institutions a license to discriminate against LGBTQ patients on the basis of religious and moral objections. Under the proposed regulation, providers could refuse to perform healthcare procedures, including those related to gender transition and reproductive health. In short, this regulation would allow for sweeping and dangerous exemptions to patient protections, especially for LGBTQ people, and prevent patients from getting the care they need. HHS is currently accepting public comments on the proposed rule until March 27th, and needs to hear from GLMA’s expert health professionals today. As providers, you know LGBTQ people already face discrimination and barriers in accessing healthcare, and that this proposed rule would only make things worse. Speak up now and tell HHS why you oppose the proposed rule! Please feel free to use the template below to craft your comments and submit here (click on the blue “comment now” box on the top right hand side of the page). All comments are due to the HHS no later than March 27th. Please cut or add to the highlighted section prior to submission, and include your name and credentials at the end of the letter. As a healthcare provider, I am in full agreement with our professional standards that put the care of patients first, ensuring equal and quality care for all. But the proposed HHS rule, titled “Protecting Statutory Conscience Rights in Health Care,” would allow healthcare providers and institutions to discriminate on the basis of moral and religious objections, placing vulnerable populations such as LGBTQ individuals and people living with HIV at risk of being denied necessary and even life-saving care. By allowing discrimination against patients on the grounds of moral and religious objections, the proposed rule obviates the ethical standards that healthcare professionals are charged to uphold. Research shows that LGBTQ people, especially transgender individuals, face significant discrimination and barriers to quality care. The proposed regulation will lead to increased discrimination and flat-out denials of care for some of the most vulnerable members of our community by expanding religious exemptions in a way that could result in dangerous denials of medically necessary and life-saving care. Additionally, the proposed regulation lacks safeguards to protect patients should they be denied care on the basis of religious beliefs. In extending religious accommodations, there should be an equal extension of protections to ensure all patients receive clinically and culturally competent care. LGBTQ and all Americans deserve better. The proposed rule presents a direct conflict with nondiscrimination standards adopted by the Joint Commission and all the major health professional associations who have recognized the need to ensure LGBTQ patients are treated with respect and without bias or discrimination in hospitals, clinics and other healthcare settings. Along with many other healthcare providers and professionals, I oppose this proposed regulation. 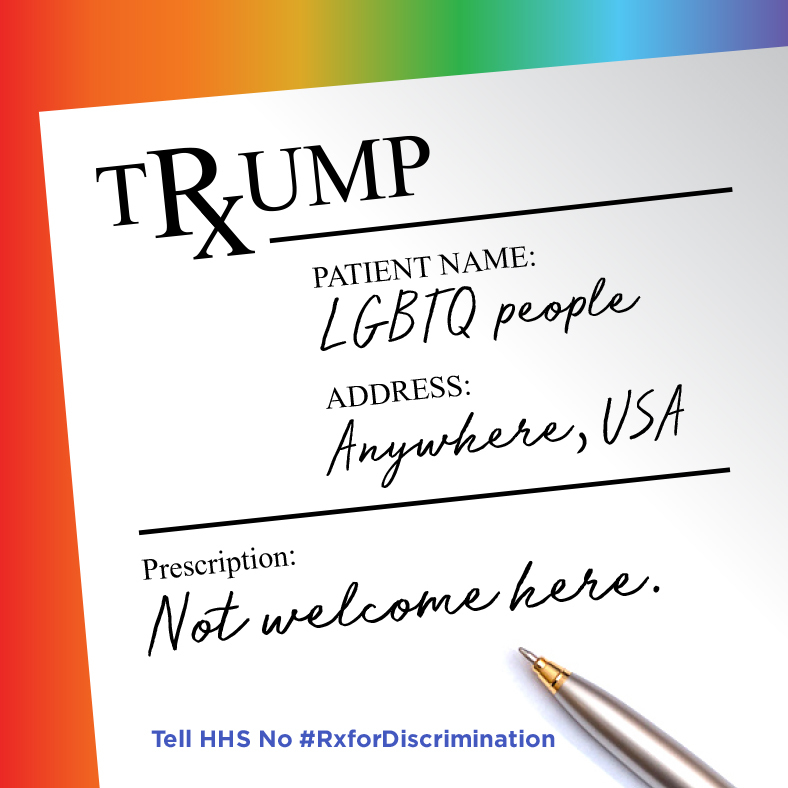 Promoting discrimination on the basis of moral and religious beliefs is wrong, and will harm millions of Americans in accessing medically necessary and life-saving healthcare.